Which kind of country is this again? Is Nigeria a comedy nation or we are doing reality show here? 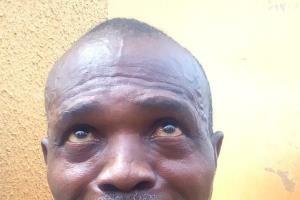 A 55-year-old man, Tunde Ijagbulu who was caught with a fresh human head in Osogbo told the police that it was just a joke and that he didn't know that it would become a serious matter. It was a perfect example of tragicomedy as the suspect burst into a loud laugh while explaining how he got the fresh human head that was found in his possession by the police. Ijagbulu claimed that some internet fraudsters also known as Yahoo-Yahoo boys brought the human head to him to make money ritual for them. He said that he was not a real herbalist and that he is just a fraudster and that when the Yahoo-Yahoo boys came to him to request for money ritual, he wanted to dupe them and make money from them. So, he asked them to bring human head. In a chat with the Nigerian Voice, the suspect said “Yahoo-Yahoo boys came to me and requested that I should make money ritual for them because the white people were no longer paying them.” The suspects said the Yahoo-Yahoo boys told him that the internet fraud was no more lucrative like before and that they want to migrate to Yahoo-Yahoo-plus which means money ritual. While parading the suspect, the Osun State Commissioner of Police, Mr Fimihan Adeoye said the matter would be properly investigated and that the suspect would face the full wrath of the law.